Chanel is a legendary fashion house, but also a little known but highly respected supplier of high-end components to brands like MB&F and Richard Mille. 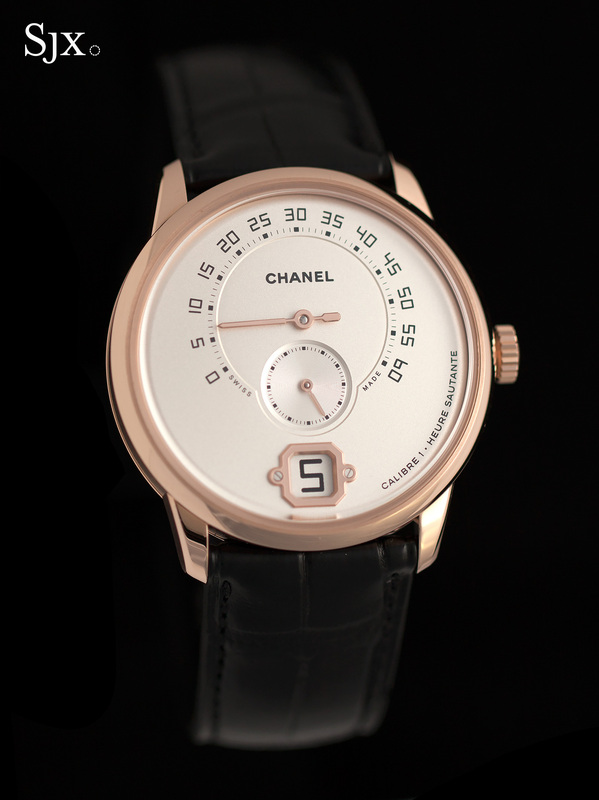 Despite all that, Chanel still comes up short in haute horlogerie credibility of the sort that excites watch nerds. Just unveiled at Baselworld 2016, the Monsieur de Chanel changes that. 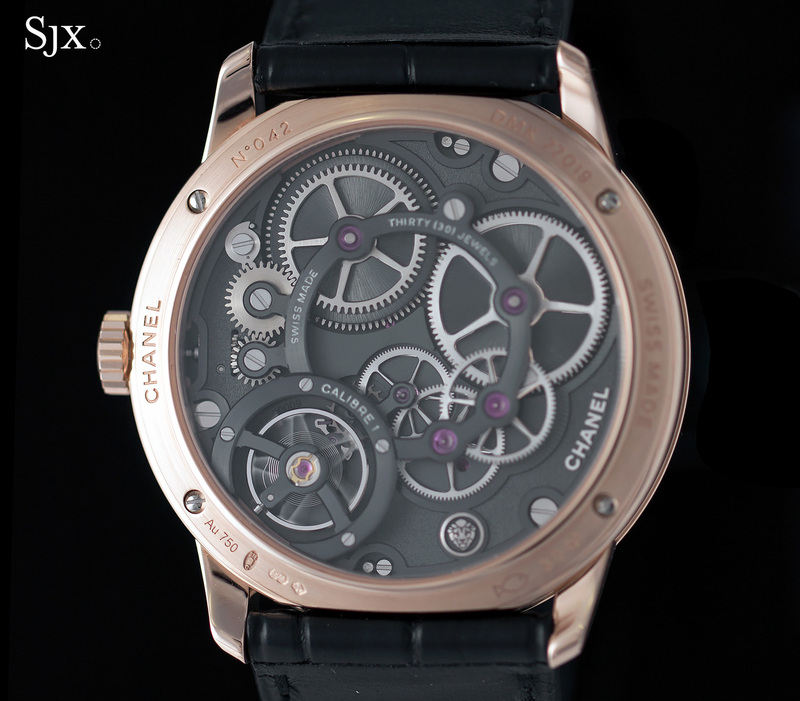 Conceived from the ground up as a solidly technical watch for men, the Monsieur de Chanel is powered by the Calibre I. Because both the watch and movement were designed from scratch, the layout of the dial is handsomely symmetrical and linear, with the retrograde minutes, sub-seconds and hour window sitting on a vertical axis. The coherence of the dial and movement is outstanding. Designed specifically for this watch – in fact, the Calibre I will not be repurposed for any other timepiece – the movement is an integrated complication. That means the retrograde and jump hour functions are part of movement, rather than being a self-contained module which would have been an easier and common solution. Another uncommon feature of the movement is the 240 degree retrograde minutes, in contrast to the typical 180 degree retrograde. More complex to execute, the wider angle also allows for more coherent design, with the sub-seconds fitting neatly into the minute scale. 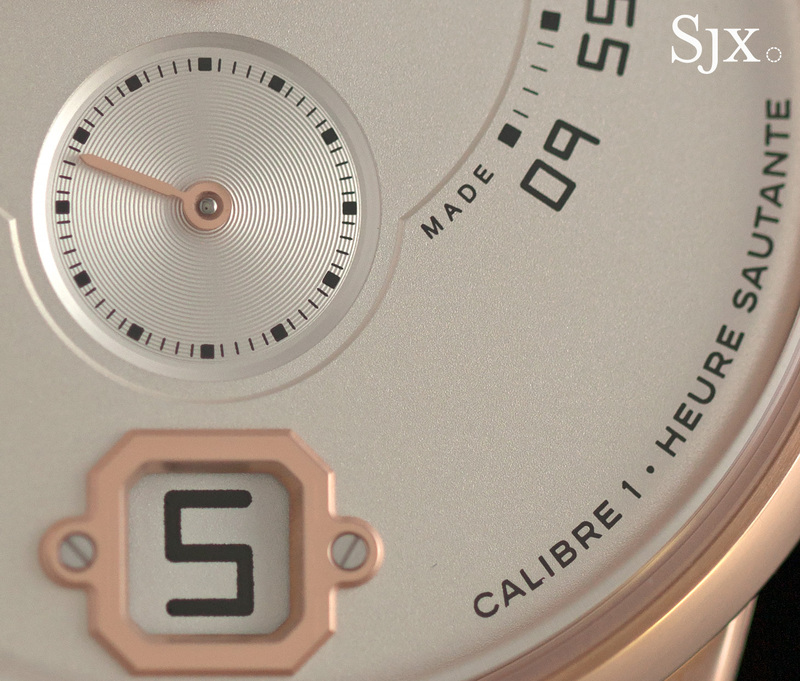 Equally importantly, the Calibre I is also user-friendly. 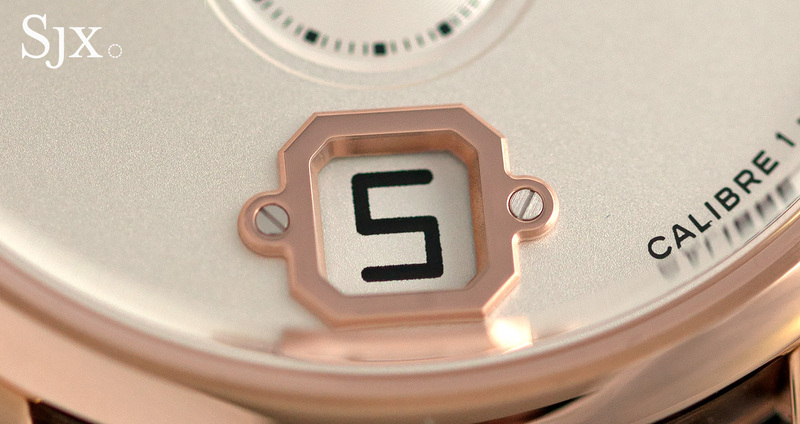 The retrograde minute hand can be set forwards and backwards, with a blocking mechanism at “0” to prevent it from going beyond. And the Calibre I features twin barrels that unwind one after another, providing sufficient power for the displays as well as a useful three-day power reserve. 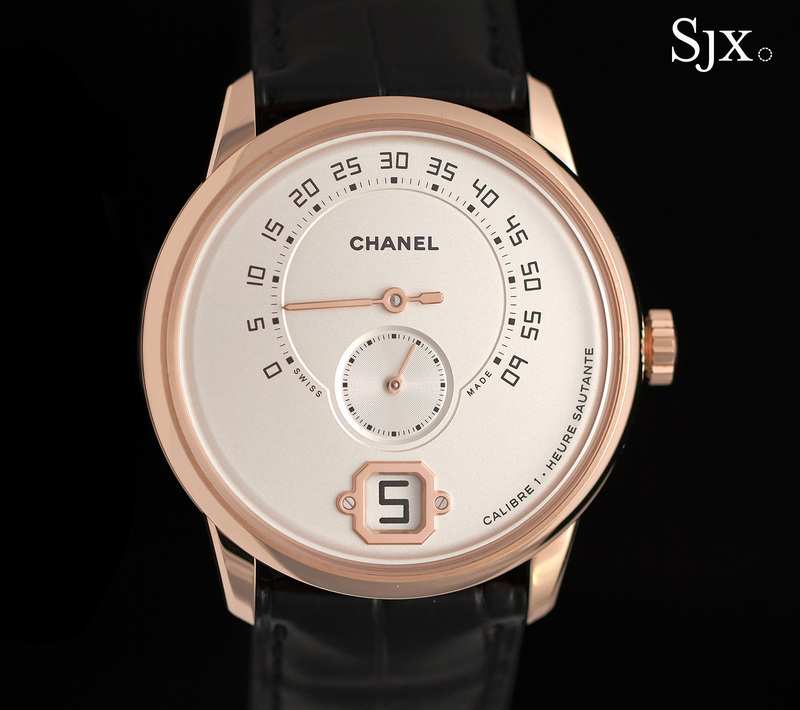 As is evident from the dial design, the Monsieur de Chanel is heavy on the motif of repeating circles. That is even more pronounced in the movement, with the gear train, barrels and balance wheel laid out in a circle, secured by a slim, circular bridge. Visually the movement proportional and pleasing to the eye. Up close the Monsieur de Chanel abounds in more carefully executed details. On the dial both the minute hand and hour window frame are octagonal in shape, echoing the Place Vendome in Paris as well as the Chanel No. 5 perfume bottle. 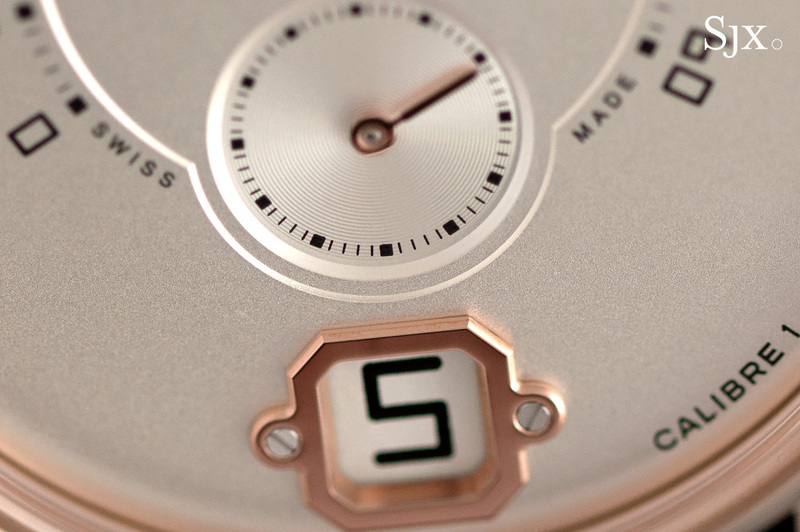 The minute hand has a pleasing thickness to its profile, along with bevelled edges. Similarly the jump hour window frame is also bevelled, held down by a pair of screws with grained heads. Likewise the movement acquits itself well, even up close. Especially well done are the wheels of the gear train, which feature precise, diamond-cut bevels on their spokes. 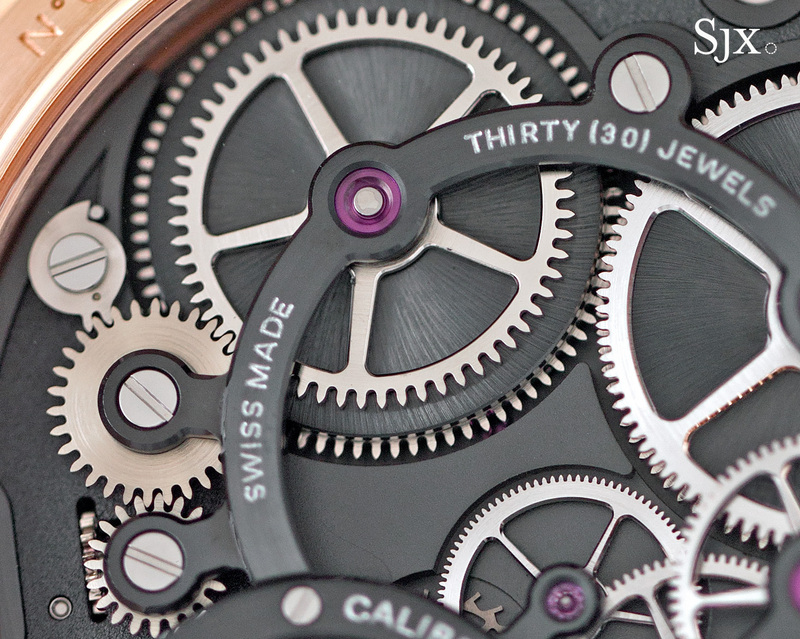 All the wheels in the watch, and all future in-house movements, are made by Romain Gauthier – more on that below. The finish on the movement is muted but nuanced. Though all the bridges and base plate are coated with the same black plating, the different surface finishes, ranging from straight or circular graining to frosting, give the movements varying shades of black. The designers were also careful to fill the watch with elements associated with Chanel, most of which were derived from objects in Gabrielle “Coco” Chanel’s apartment in Paris. Those include the lion head that is found on the dial and crown, and the star-shaped balance wheel – one that, as expected for a serious movement, is a free-sprung, adjustable mass balance wheel. Evident from the details of the watch, the Monsieur de Chanel was a long time in the making, being the result of a five year effort to build a technically credible men’s watch. Chanel assembled a team of eight to design and construct the movement, which is mostly made in-house. Save for the wheels, which are made by Romain Gauthier. Trained as a machinist rather than a watchmaker, Gauthier has long supplied precision components to other brands and is now responsible of the wheels in all of Chanel’s in-house movements. The Monsieur de Chanel with the Calibre I is just the first of a planned series of men’s watches with in-house movements. Though it is little known, Chanel is actually a major player in the world of exotic horology because of its ownership of G&F Châtelain. Acquired almost 30 years ago, Châtelain mostly makes cases and bracelets, and is one of the two outfits able to make ceramic watch cases (the other is Swatch Group subsidiary Comadur). 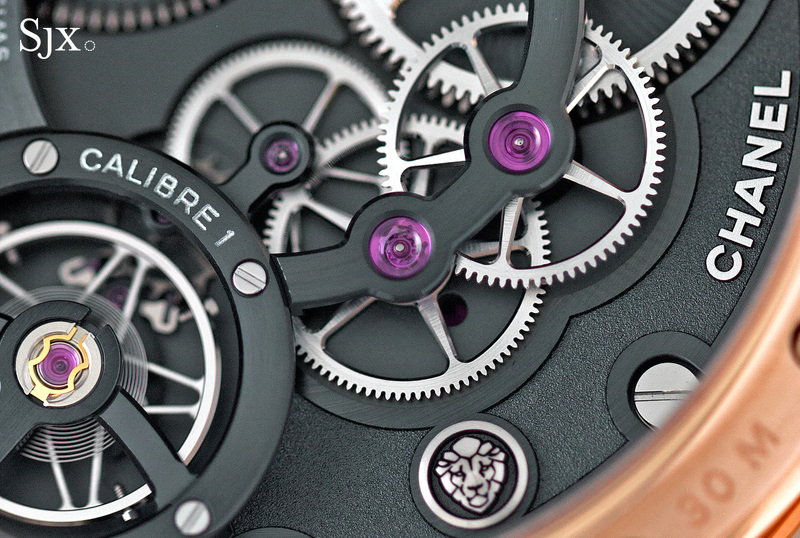 Amongst Châtelain’s clients are MB&F, which relies on its for cases, as well as Richard Mille and Urwerk, both of which use Châtelain’s patented, spring-loaded folding clasp. The Monsieur de Chanel is limited to 300 pieces a year, either in white gold or beige gold, an alloy proprietary to Chanel that’s a cross between yellow and rose gold. As for the price, it is a lot of money, though not quite so pricey given the quality of the movement. That being said, the price tag will discourage anyone who wants to experiment with a watch from a non-traditional watchmaker so perhaps a less complicated, stainless steel offering is in order. The Monsieur de Chanel will retail for €31,500 in beige gold and €33,000 in white gold, including 19 percent value-added tax. They will hit stores in June 2016.